Most travellers bundle up Vienna, Prague and Budapest together in one trip. Some others, like us, land in Vienna, explore the city and then move on to further explore Austria. Whether you are exploring the capital cities of Europe or are spending more time in Austria, you will possibly end up spending two days in Vienna, which are enough to only get a glimpse of this city. There is so much to explore here – museums, palaces, music and opera, parks, shopping arena and of course, food. If you want to truly experience it all, you will need much more time than just a couple of days. Start your day at the Vienna State Opera, which is one of the top opera addresses in the world. During season, this famous stage offers a different program every day, with over 50 operas and ballet works on around 300 days per season. If you can afford to, and the opera season is on, attending a performance in the Vienna State Opera is one experience that you should not miss. Whether you attend a performance or not, do participate in the tour that takes you through the grand opera house. The grandeur of the opera is worth seeing – the seating arenas, the large stage and the even more impressive back stage, which will make you want to attend a performance. The famous Sacher Hotel is very close to the Vienna State Opera. Make sure that you budget sometime to enjoy the famous Sacher Torte with a cup of coffee here. It is a great place to have lunch and take a break. The Museum Quartier (up next in the itinerary) will involve a lot of walking. By mid day (about 1 pm), make your way to St. Stephen’s Cathedral, which has been standing tall since 700 years. It is one of the most important Gothic structures in Austria. The cathedral is huge and can be seen for any and every high rise building in Vienna. 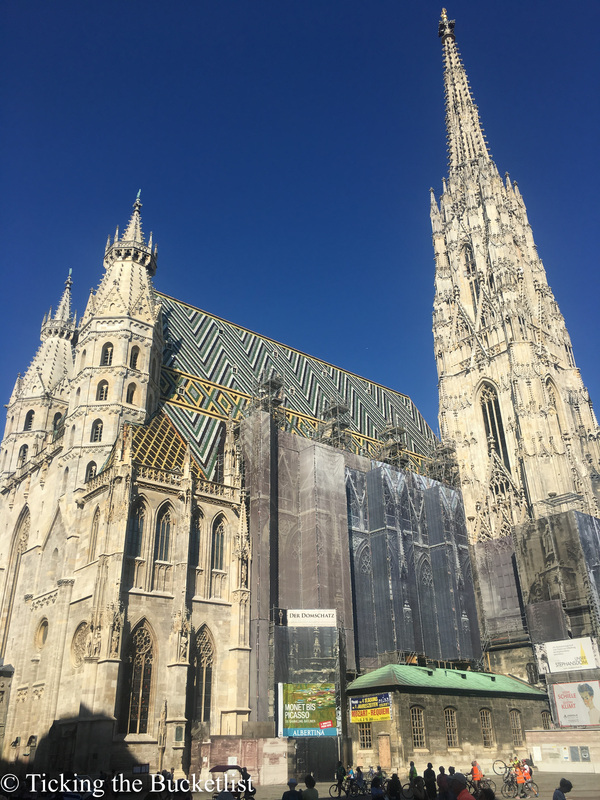 The colourful roof tiles of the roof of the cathedral were laid to create the Royal and Imperial double-headed eagle and the coat of arms of the city of Vienna. The cathedral organises guided tours of the church and the catacombs at about 1:30 pm. Next, head to the Museum Quartier, which figures in top ten cultural areas of the world, by size. There is so much to see here that you can spend almost a week in the city if you intend to visit all the museums and galleries. The Austrian National Library, which is supposed to be one of the most beautiful libraries in the world is also located at the Museum Quartier. Considering that we had little time at hand, we chose to visit the Imperial Palace (Hofburg) only. The Imperial Palace, which until 1918 was inhabited by the imperial family, was originally a castle built in the thirteenth century, which was extended to a splendid residence in accordance with the increasing power of the Habsburgs and the expansion of their realm. Today, the Imperial Palace houses the office of the President of Austria as well as an important congress center and numerous art collections, which represent the imperial family’s passion for art. 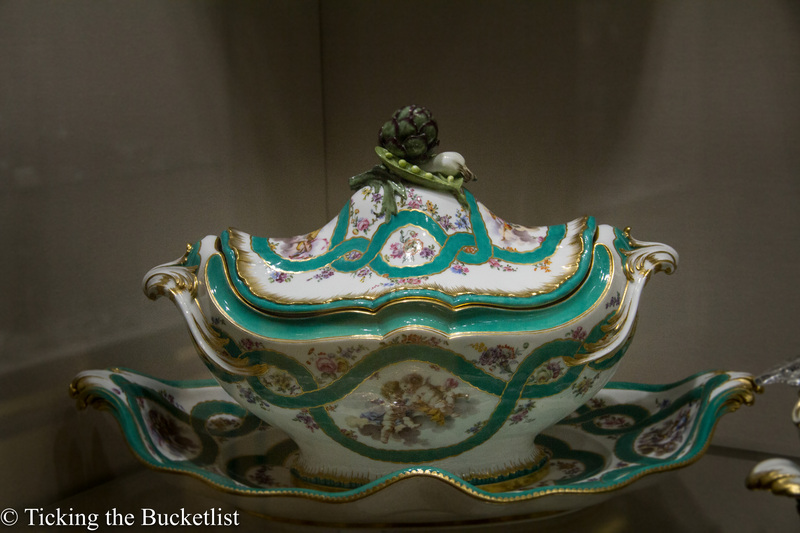 It was interesting to see the personal items that once belonged to Empress Elisabeth and possibly portray the true personality of the frequently misunderstood Empress. Budget at least 3 – 4 hours to enjoy the exhibits in the museum. The Spanish Riding School also holds a performance here, which is held in the morning. If you do wish you attend it, book your tickets online and be there in time. End the day with some shopping at Stephansplatz. 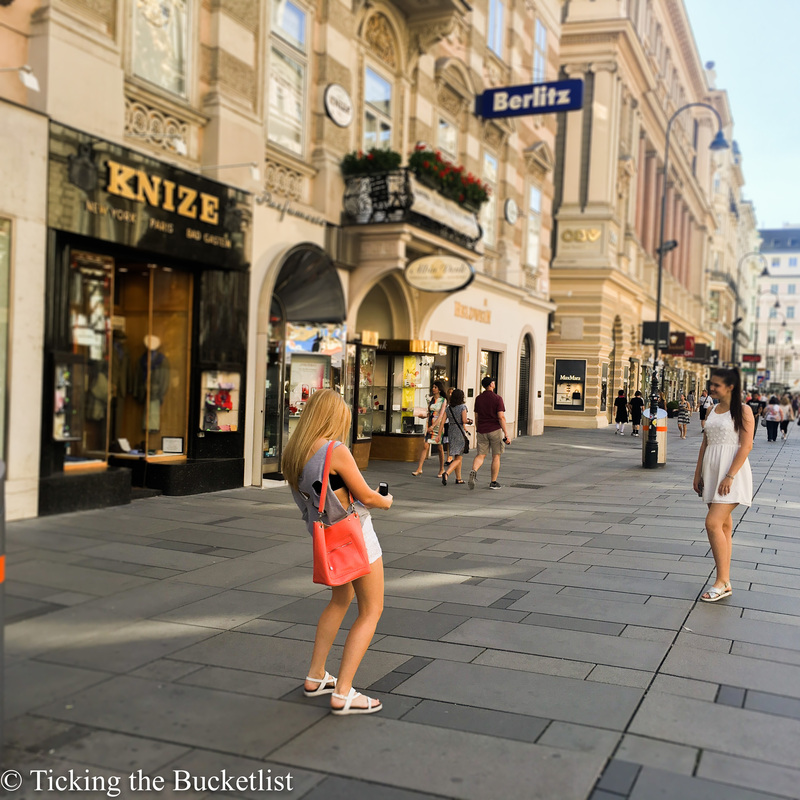 I found it to be the best shopping area in Vienna, with an array of designer outlets and renowned brands. The place comes alive with buskers during the evening and there is music all around. The lively square is lined with plenty of restaurants to let you sample local as well as international cuisine. Left to me, I would budget at entire day from Schonbrunn Palace and Zoo. Possibly, it was my favourite place in the city. Schönbrunn Palace, the former summer residence of the imperial family, is one of Europe’s most impressive Baroque palace complexes and will give you a peep into the life of the Habsburgs. The land had been in the possession of the Habsburgs since 1569, when the wife of Emperor Ferdinand II had a summer residence built there in 1642, which she called “Schönbrunn”. The palace and garden complex built here from 1696, after the Turkish occupation, was redesigned from the ground up by Maria Theresia after 1743. During summers, the palace gardens are stunning and Gloriette is a great place to have cup of coffee. The first time we saw a polar bear! The palace is not only a museum; the large complex also houses the oldest zoo in the world has in recent decades turned itself into one of the most modern and – by general consensus – one of the most beautiful zoos in the world. More than 700 – some highly endangered – animal species live here: from Siberian tigers and hippos to one-horned rhinoceroses. Other Highlights: the Koala House, the lion pen, the South America Park, the aquarium and terrarium with coral reef and the “Polarium.” Every kid with enjoy spending time in this animal kingdom, as did we. We saw a giant panda and a polar bear for the first time here! Another attraction that we throughly enjoyed was the apple strudle show. Not only did our lovely chef share the recipe, we even got to eat the goodies. This was another activity that kids enjoyed. Another family entertainment in Vienna is the Prater Park. Many many year ago, this used to be a hunting site for the Habsburgs. It is now a green lung of the city, that also offers lots of exciting activities. There is a giant ferris wheel to that offers a stunning view of Vienna. There are joy rides for kids, beer gardens for lovers of the ale and restaurants for food lovers. There are walking and hiking paths to let you exercise your muscles. All this makes Prater one of the best city parks in the world. The Belvedere Palace is one of the most stunning buildings in Vienna. Its reflection in the pool makes it look even more mesmerising. The exteriors of the palace will make you go shutter crazy. However, we would recommend that you buy a ticket to visit the interiors only if you are an art lover. The galleries exhibit some of the best works of art ever produced, which will surely please an art lover’s keen eye. We were lucky to see the paintings made by Gustav Klimt, including his famous work – The Kiss. End your day with some fine food in one of the restaurants in Vienna . We ate at Huth and enjoyed the experience. They had a couple of vegetarian items on the menu, which were delightful. We had two fun filled summer days in Vienna. We now want to get back to the city sometime in winter to witness the lively Christmas Markets! There is a lot more to do in Vienna. Let us know your must dos and must sees in Vienna! Many thanks to Vienna Tourism Board for facilitating our trip and ensuring that we had a great time! Beautiful pictures and nice place to visit. Was very interesting to read your take on Vienna. It is my home and I think you captured it well, glad you had fun. Vienna looks absolutely stunning! St Stephens Cathedral is top of my list and Belvedere Palace looks breathtaking! Schonbrunn Palace looks amazing too! Thanks for sharing! I am definitely saving this article. Every photo was seriously so beautiful and I can only imagine that it must’ve been even more incredible to see it in person! Vienna is very high on my list, as many famous composers made the capital their home (Mozart, Beethoven, etc.). Thank you for sharing! Two days and a wrap on Vienna. Yes, its do-able and you managed to include all the essentials too. Like in any other city, a capsule version is always possible. Personally, I prefer more time to explore. I absolutely adored Vienna when I visited, and I think the 2-day itinerary you have presented is spot on. St. Stephen’s Cathedral was absolutely incredible and totally worth the visit. 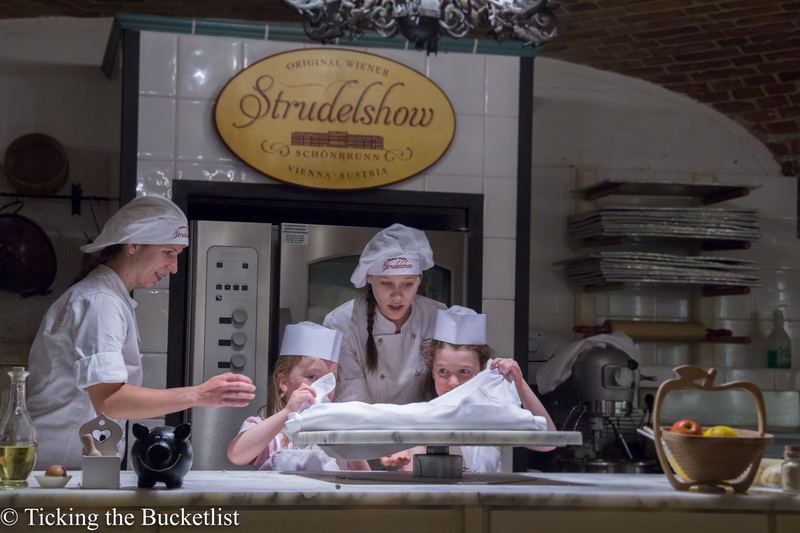 I wish I saw the Apple Strudel show though – that sounds like so much fun…and so yummy! Is the Sacher Torte as good as it looks? I think I’d prefer to enjoy it with a glass of milk rather than a coffee. Vienna looks gorgeous, judging by your photos alone. I would love to see St. Stephen’s Cathedral and the schonbrunn Palace myself. I love that there are so many things to see and do in just 2 days! Schonbrunn was our favourite too! We even liked the state opera a lot…do try and include that in your itinerary as well. I’ve got the whole Vienna, Prague, Budapest thing on my list! Thanks for including tips for kids and vegetarians. I’m sure my kids would love the zoo and palace. I think I’d like longer than two days but you can see quite a lot in this time it seems. We too wanted to do Prague and Budapest…but Austria has so much to do, that we thought lets spend more time there…and we are so glad we did! Alpbach and Hallstatt were such awesome places! Do check out our itinerary…you might want to do more of Austria than spend time only in Vienna! St. Stephen’s Cathedral looks magnificent and the reliefs and sculptures of the Museum Quartier look beautiful. We would love to visit Vienna someday soon and we would definitely miss on shopping and the old zoo for a glimpse of the polar bear. Thanks for your post. We loved the cathedral. However, if you do have time, you must visit the Melk Abbey which is just a couple of hours away from Vienna. I havent seen an abbey even half as impressive….its a must go if you are in Austria! I absolutely love Vienna – I’ve been there twice (once in summer and once in winter), but really want to go back at some point. Having said that, it’s really hard to see everything in two days! The first time we visited, we had about 4 days, I think – and we struggled to fit everything in. Schonbrunn was definitely the highlight of our trip (those rooms are AMAZING!) and I’m so glad you included the apple strudel show 😀 It was so delicious, and I’m fairly sure I still have the recipe somewhere! Oh yes…the strudel was so yummy! I would have loved to have a couple of days more….maybe destiny has another trip planned for us soon! Oh wow, I can’t believe you managed to do so much in 2 days! Did you feel super rushed though? How many days do you think is ideal? Sounds like you had a wonderful time! It was a little rushed. I would have loved to have four days here….there were so many museums that we would have loved to see if we would have had time. Its a great city …I am sure you will love it! We’ve been wanting to go to Vienna for so long! We spent a few days in Hallstatt back in 2014 and absolutely loved the little glimpse of Austria we caught. The opera and the struddles are very high on my list! It is such a lovely city that we would love to revisit it and spend a little while longer! Vienna is amazing. We were there last year and will be there again this month. We saw an opera during our last visit, could not follow the language (surprisingly we were not the only ones!) but could understand the story as it was based on Cinderella. There is a translation of the dialogues in English which one can read on your seats but that takes your eyes away from the stage. The Opera House is magnificent from inside as it is from the outside. Overall it was an amazing experience. This time we will be visiting the usual sites in Vienna, and, make a trip to the Wachau Valley as well.